Last week, Facebook introduced a new feature called "Places" that allows you or your friends geo-tag your location using the GPS in your mobile phone or location aware browser. Naturally, people either hailed this as a super cool or flipped out and had kittens because "Big Brother" had found a new way to keep tabs on where you go and what you are doing. The New York Times, has a good article on the new Places feature in Facebook, which is also available in the latest version of the mobile application for Apple's iPhone. Moments after Facebook introduced a new feature called Facebook Places on Wednesday that allows its users to share their location and find their friends, advocates raised flags over online privacy. The American Civil Liberties Union of Northern California cited concerns over the new product, saying Facebook neglected to include several crucial privacy features. The A.C.L.U. also expressed concern over the integration of Facebook’s Places feature with third-party Web sites and applications. 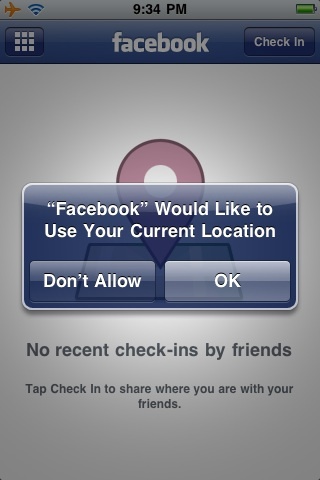 The Facebook Places privacy settings can be configured via custom settings in your privacy controls. Android Central has a quick set of directions posted which I linked to last week. 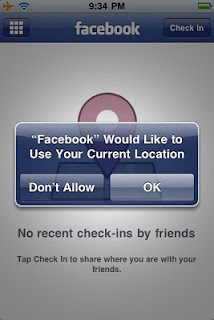 iPhone users who want to keep their locations on the down low can tap the Don't Allow button that pops up any time an iOS app tries to access the GPS on your iPhone. (You know, I'm really glad that Steve Jobs insisted on that pop up!) As of this posting, the Google Android, RIM BlackBerry, and HP Palm webOS clients haven't been updated to use of the Places feature; but it is only a matter of time before they are updated too. You can read the full article on The New York Times website.